Notes: Greencastle is a castle in County Down, Northern Ireland. It is a royal castle built in the 13th century. While it dates mainly from the 13th century, it had substantial 15th- and 16th-century alterations. The large rectangular keep with three vaulted chambers at the ground floor is approached across a rock-cut ditch. It was originally surrounded by outer rectangular walls with four corner towers (ruins of some remain). It is likely to have been built by Hugh de Lacy, along with Carlingford Castle on the opposite side of Carlingford Lough, to guard the narrow entry channel to the Lough, and the ferry crossing between the two. The motte from the earlier Norman, wooden, Motte and Bailey Castle (possibly built by John de Courcey) is still on the seaward side nearer the point. According to one legend John de Courcy was married at Greencastle Castle, but this may have been at the original motte & bailey castle. According to the information boards at the site it was held for the English Crown by Richard de Burgh, Earl of Ulster, from 1264-1333. It was attacked and taken by Edward Bruce, the brother of Robert, in 1316. This was in spite of one of Richard de Burgh's daughters having married Robert the Bruce himself. 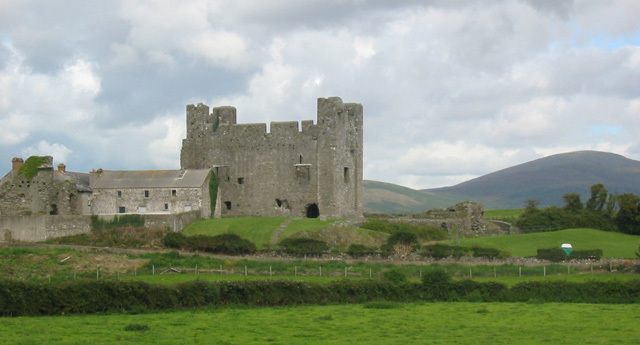 It was attacked at least twice by the Irish in the later 14th century but still maintained as an English garrison in the 1590s. In the 1500s it was held by the Earl of Kildare and then Nicholas Bagenal of Newry. It fell into disuse after a bombardment by Cromwellian soldiers, to stop it being used by rebel forces. The castle is a state-care historic monument in the townland of Greencastle, in the Newry and Mourne District Council area, at grid ref: J2473 1184.